I can't believe it! We've done it! We're through to the semi finals of the Europa League! A good direct attacking start from Manchester United led to Mkhitaryan breaking the deadlock early on. A great ball by Paul Pogba to set Marcus Rashford off down the left wing led to Rashford passing to Mkhitaryan who slotted the ball home, scoring his 10th goal of the season. After that goal it was the same old story. We didn't show the desire to kill off the game. The chances we did create were squandered by poor finishing. These misses proved to be costly as Anderlecht managed to grab the equaliser after some sloppy Manchester United defending. The game then went to extra time and Manchester United were in total control of the game. 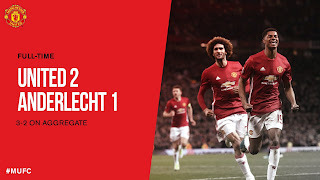 Anderlecht were lucky to get a touch of the ball but poor finishing from United meant that Anderlecht were still in the game until the last minute. With Marcus Rashford missing a 1 on 1 and Zlatan Ibrahimovic missing dozens of chances, it felt as if a goal was bound to come at some point. We almost scored the goal of the season when Rashford's rabona cross was met by an overhead kick by Pogba but the defender managed to block the shot which was destined for the back of the net. Our winner was scored by one of the best young talents in world football at the moment. A ball into the box by Martial was met by Fellaini who headed the ball down to Marcus Rashford who turned away from the defenders and curled the ball into the bottom left corner of the net with his weak foot. It was a beautiful finish by an exceptional player. Two massive blows for United are that Marcos Rojo and Zlatan Ibrahimovic look to have picked up long term injuries. Rojo came off in the first half with what looked like a knee injury and Zlatan seemed to have hyperextended his knee and it did not look good for the Swede. Hopefully the injuries sustained won't be too serious and they can return soon. Today's performance was not good to watch as a United fan. Just as it seemed like we had taken a step forward after the Chelsea game, today it looked like we took two steps back. The tie was not over until the final whistle and the players are to blame for that. However, we done enough to make it through to tomorrow's semi final draw and that's what matters most. There are only 3 more games left that we need to win and that's Champions League football secured for next season. But it's easier said than done, that's been proven today. Out next game is on Sunday against Burnley, another must win game. With fatigue kicking in from playing extra time today and the additional players added to our injury list, I think it's inevitable that Jose Mourinho will make changes and rest players for the match. Nonetheless, we need to play at our best and win the game to keep fighting for a top 4 spot.